We recently paid a visit to Austria during Project Around the World, and I must say that I thoroughly enjoyed the time. We did something a little different this time. We didn’t pull our inspiration from something we could see, instead we pulled our inspiration from something we could hear. Austria is a country that is very rich in history and in culture. There were so many places to draw our inspiration, from the food, to the architecture, to the castles, to the Alps. I was paralyzed with the choices for awhile. But, then it hit me, the music. I’ve always loved classical music and since Austria was the birthplace of many famous composers, I knew I’d found our inspiration. It was time for some Mozart. Sheet music. I printed off my sheet music here. Paint. Use acrylic or craft paint. We used our Crayola paints. 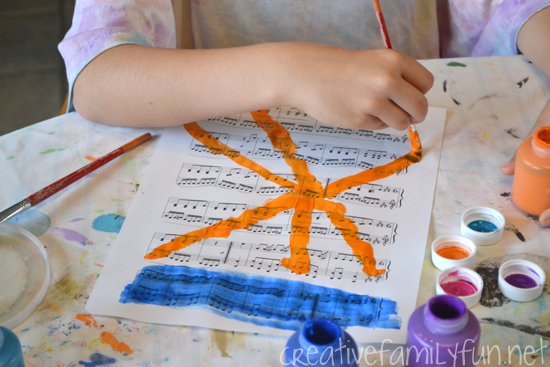 Watercolor may smear the ink from your sheet music if you print off your own. Music. We chose a Mozart cd that I’ve owned for many years. It’s no longer being produced, but you can find many other great choices. If you don’t already have a cd, check with your local library to find one to borrow. 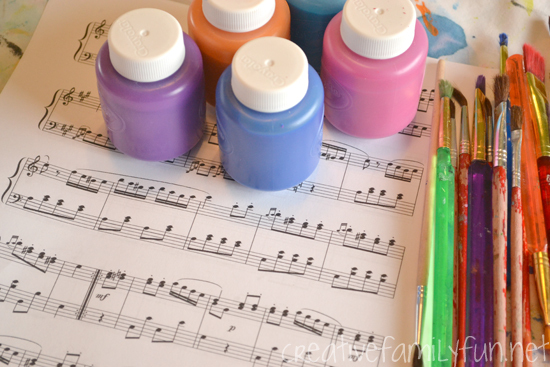 Before we started listening to our music, we read a little bit about Mozart. I found the book, For the Love of Music: The Remarkable Story of Maria Anna Mozart by Elizabeth Rusch at our library and decided to use that as inspiration. It only touches on Mozart’s life while telling the story of his sister Maria Anna. But, it paints a beautiful picture of the time period and his family life and is peppered with musical terms. It was a great introduction to our project. 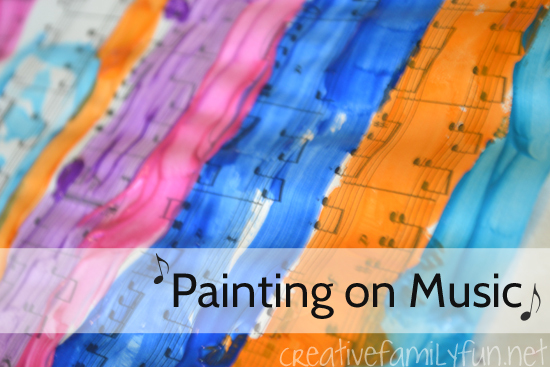 We turned on the music, got out our paints, and started creating. There were no rules. Our goal was to just listen and create. 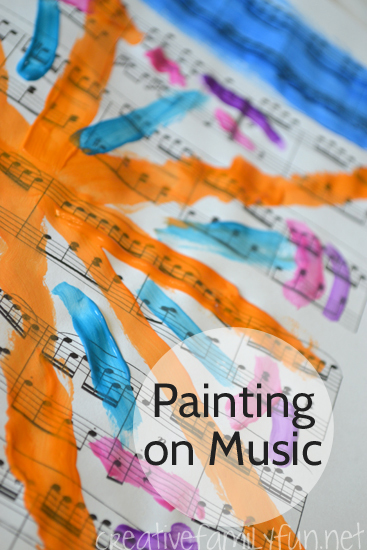 We listened for awhile and started painting what we heard. No one painted anything in particular. It was all a series of lines, curves, and flourishes. There was no plan, just free-form painting. When we were done and all the paintings were spread out to dry, I realized just how beautiful our creations were. 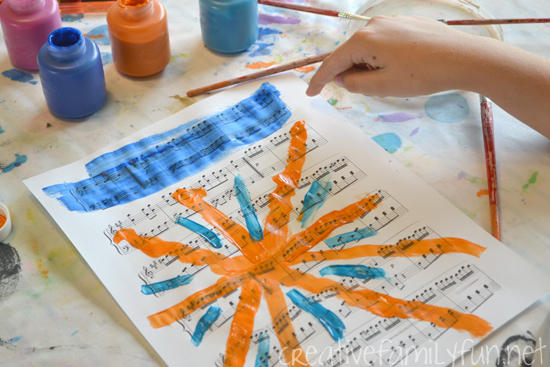 We painted what we heard and the sheet music provided such an interesting backdrop. It was a fun creative exercise and one that I plan on trying with different genres of music in the future. In addition to our art project, we also learned more about Austria, the tradition of the Lipizzaner horse, and Austria’s involvement in World War II by reading a book in our new favorite series, Horse Diaries. We read book #4, Maestoso Petra. You do not have to read these books in order and each one can be a stand-alone book. Maestoso Petra was told in first person from the point of view of one of the famous Lipizzaner stallions. It was fascinating and completely appropriate for your elementary-aged kids. I read it aloud to my 1st and 3rd grader and we enjoyed it so much that we’re now reading the entire series together. Thank you for following along during our artistic journey around the world. 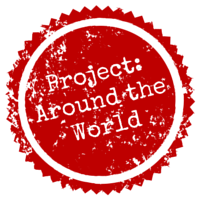 To find all our projects so far, please click here or on the image below.